This frosting reminds me of the kind you get on bakery sheet cakes. It’s delicious, easy to pipe, and easy to spread. In a large bowl, cream butter and shortening until light and fluffy. Add salt, vanilla, confectioners’ sugar and milk. Beat well. instead of using 1/2 crisco and 1/2 butter, can you just use all butter? what does the crisco do- is it to make it healthier? Yes – this is the best buttercream frosting ever! It’s just what I’ve been looking for! 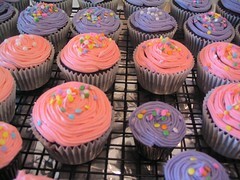 And your pink and purple cakes are sooo cute! Can you make this into a chocolate frosting by adding cocoa powder? Or is that just a really dumb idea? DC, I believe you can. In fact, I think I remember people talking about that on All Recipes. Will the butter and butter flavored Crisco make the frosting look yellowish/ivory when it’s ready? What if I want a white buttercream frosting? I am sorry, but I didn’t think this was the “best ever” frosting at all. I think it has too much sugar in it. I’ve seen other similar recipes that call for less sugar. It overpowers the taste of the butter/crisco. I am not a novice baker either. It just wasn’t my favorite. Oh, and to DC…that is not a dumb question at all. You can add cocoa to make it chocolate, but you might want to do a search for it to get the proper measurements. I’ve also seen it with melted chocolate in it. Well, I did the recipe to a tee, and once they cooled they were like hard, dense, little hockey bucks. NOT light and fluffy like I had imagined. Hopefully the kids at my daughters school won’t notice how bad they really are. Sorry, the recipe gets a thumbs down from me. Maybe there are just 1 too many eggs. Sorry, my last comment was for the cupcakes to go with this frosting. The frosting is perfect! dc, my mom owns a cupcake shop so I know alot about them.(??s). with buttercream icing u can pretty much add any flavor to. so the answer to your ??? is YES?!!! ps. it’s not a stupid ??? I made a mint version of this today and it is delicious, however 5 cups of sugar was WAY too many. I used 4 for a good piping consistency. I made this frosting today for my daughters birthday cake but used a cup less of sugar. It is very good. If you use all butter and no crisco, your icing will not hold up very well, and will melt easily if you are attempting to pipe it. This frosting is great! I make alot of cakes and it is the best i have ever used… I think 4 cups of sugar is plenty…. I am making some brownies for my cousin’s graduation and wanted to know how many cupcakes does this recipe frost?? Thanks so much!! I have to make 50 so trying to see what all I will need. This is an awesome recipe…just made it and used lemon extract instead of vanilla. Perfect in every way, thanks for this!! What if you used half crisco and half butter crisco instead of half butter half crisco butter?? I just love this frosting!! I have been decorating cakes for over 30 years! Best frosting ever! I won’t use anything else!! Blessings to u!! Just know u r a part of every one of my grandchildren’s Birthday cakes! !